Italy’s pinot bianco (called pinot blanc in France and weissburgunder in Germany) is arguably one of the best in the world. Nowhere else does the variety reach the level of purity and precision it does in northeastern Italy, especially Alto Adige. A mutation of pinot grigio (which is in turn a mutation of pinot noir), pinot bianco is more floral, steely and mineral-driven than pinot grigio. 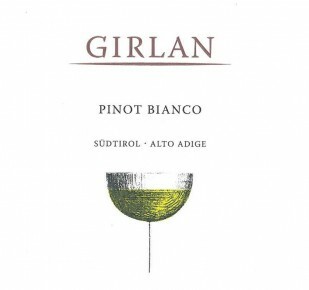 Girlan’s Pinot Bianco offers textbook aromas and flavors of white flower and apple blossom. A lively palate makes Pinot Bianco an ideal aperitif or an excellent accompaniment for white meats and fish. Hillside, gravelly soil rich in minerals resulting from ice age sedimentation. The grapes are picked by hand and placed in small containers to prevent excess pressure on the grapes. Gentle pressing and clarification of the must by natural sedimentation. Fermentation in stainless steel tanks at a controlled temperature, a small part is continued with malolactic fermentation.